Toyota issued an announcement today following a discussion by its managing officer, Mr. Satoshi Osigo regarding the details of the next generation Prius. The Prius is presently in its third generation in the US. Each new generation has brought incredible efficiency gains and the current Prius family of hybrids can rival the cost per mile to operate an electric-only EV. Prius is also available as an EV in the form of a plug-in hybrid. The biggest news is that Toyota expects the gasoline engine of the new Prius to be greater than 40 percent thermally efficient. That thermal efficiency will be the world’s best for a production car internal combustion (IC) engine. The current Prius has an engine that boasts a thermal efficiency of 38.5 percent. Proponents of pure EVs like to seize upon the low thermal efficiency of IC engines while ignoring the fact that the power generated to create electricity has its own thermal efficiency which is then reduced three times before it is used by the electric motor in a car. First the efficiency of the EV cycle is reduced in transmission to the charging station. Then it is again reduced as power enters the vehicle via the chemical process to convert that energy to battery stored power. Then finally some power is again lost as the chemical process reverses and the battery is discharged. Electric motors are also not 100% efficient. Toyota has continued research into nickel metal hydride batteries as well as lithium ion and plans to continue to use both where appropriate. All batteries will have a greater thermal density, meaning that for a given output they will be smaller in size physically. Coupled with that reduction in drivetrain size will be smaller electric motors and drive components. Toyota is also moving the Prius family to the Toyota New Global Architecture (TNGA) platform, and that means a lower center of gravity and increased stiffness in the chassis. Hence, drivability and driving pleasure should increase incrementally. The Prius Plug-in Hybrid is also being advanced along with the hybrid Prius models. That means it is almost certain that in the next generation Prius owners may be able to commute back and forth to work on electric only power, negating much of the point of the electric-only cars they compete with in the green car marketplace. Overall MPG equivalent may also match that of EVs. Mr. Ogiso commented on the PIH Prius saying “We have been listening very carefully to Prius PHV owners and are considering their requests for additional all-electric range. We have also heard from owners that they would like a more convenient charging operation. In response, we are developing a new wireless/inductive charging system that produces resonance between an on-floor coil and an onboard coil to transmit power to the battery, providing charging without the fuss of a cable.” Thus, the Toyota Prius would become an electric-capable car that does not require plugging into anything. Toyota’s vision of hybrid gasoline-electric vehicles started in 1993. 20 years later the dream has been realized and no other automaker has anywhere near the penetration into the green market that Toyota has earned. The announcement today included the timeline of testing of the new Prius as soon as 2014. 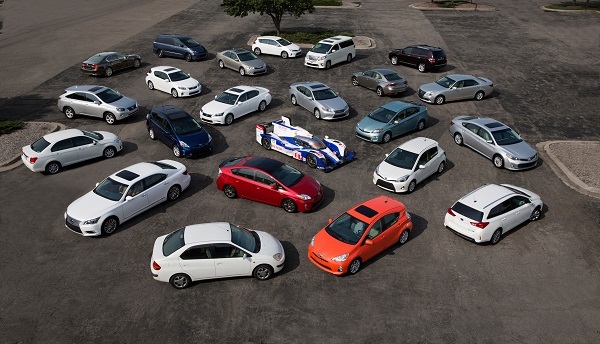 Photo courtesy of Toyota shows the company's currently produced hybrid models.